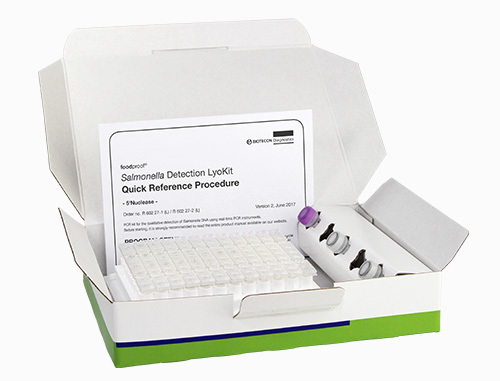 The foodproof Salmonella Detection LyoKits are based on 5’Nuclease probes and provide fast, accurate detection of Salmonella spp..
Salmonella are rod-shaped, Gram-negative bacteria. The genus Salmonella is assigned to the family Enterobacteriaceae. They cause disease in humans and animals, including typhoid fever and diarrhea. Infection commonly occurs through ingestion of contaminated food, typically eggs and poultry.